The British Isles has large and diverse areas of clay that are suitable to make pottery. Broadly speaking, the area diagonally south of York and down to Cheshire has in various places clay deposits that are close to the surface. This enabled people from much, much earlier times and up to the Viking period to dig clay for pottery without having to go too deep. Clay is very heavy, and difficult to dig out. The rest of Britain by and large had to make do with 'costly' imports that could have come from a few miles down the road, or possibly several days travel away. Their only other alternatives were wooden vessels, or in other more remote areas, 'soft' soap-stone containers. 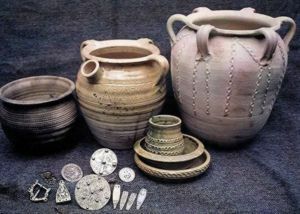 Pottery was a very important method of producing cheap cooking pots, bowls, cups, lamps, bottles, jugs, etc.. It was also used for loom-weights, crucibles and moulds. In early pagan Anglo-Saxon times pottery 'urns' were used to hold ashes of people who had died and been cremated. These were then often buried in small 'barrows'. Many of these cremation urns were highly decorated. The vast majority of the early pottery though was simply made, probably within the village or on the farm, using methods such as coiling or making thumb-pots. Later on, as shown by excavated examples, there were specialist potters who made wheel thrown pottery in towns. This was then sold by the potter, or possibly by travelling merchants in the markets, although some pottery would still be home produced. Throughout the period pottery was also imported, especially from the Rhineland because of it's decorative nature. Pots that have survived show that ceramics of the period were often decorated by rouletting, thumbing, incising, combing, stamping or by applying clay to the surface. Sometimes the pottery was glazed with simple glazes, most often of yellow or olive green (the technique of glazing appears to have been reintroduced from the Byzantine countries through France). Other pottery was decorated with a red paint or slip in the continental style. The pots were used for a variety of purposes, some for storage, some for cooking and some for eating and drinking from. Bowls would have been used for storage as well as cooking, eating and serving. Cups were generally in the form of handle-less beakers. A potter's tools were fairly simple. An animal rib or flat piece of wood for shaping the pot when throwing, knives for trimming, antler tines for piercing for spouts and bungs, perhaps a number of sheep's tibiae and metapodials (elements of the bones in the foot of the animal), as templates for rim profiles. Some carved bone and antler stamps were used with rouletting wheels for decorating the pottery. Evidence would suggest that after about 900AD the potter's wheel as we would recognise it came back into fashion. The type of potter's wheel probably varied, anything from a small turn-table (slow wheel) to a large kick wheel. Two kinds of fast wheel may have been used. The first and most likely type to have been used in the Saxon period, is basically a cartwheel mounted horizontally on a pivot, the wheel being rotated by hand or with a stick. The pot was thrown on a disc or small platform fixed to the centre or nave of the wheel. The other type consisted of a lower wheel turned with the foot and an upper wheel head for throwing the pot, the two wheels being connected by a series of struts. To make clay good enough for a pot, the Saxon potter would have to put in some back-breaking graft. After unearthing a large amount of clay, he would take his raw material, steep it in water and then beat it, usually with a large wooden 'spatula' until it was well mixed, although some potters may have worked it by treading it with bare feet. He would then remove any large stones and gravel from it. Next, he would carefully mix sand, crushed shell, grass, or even crushed pottery from broken fired pots in with it to help bind it together. Then he would have to wage it (knead it like bread), to ensure it was thoroughly mixed. The clay at this point would have to be made pliant enough by the addition of water or be left to dry some more. The potter would then take a ball of this clay of the correct size and consistency for the item he was making. This clay was formed into a pot, mainly by building it up from layers of rings which are smoothed together by hand (coiling) or, by about 900AD, on a wheel. Other methods may have included paddle and anvil techniques, with a pebble and spatula, thumb pots and moulding over wooden moulds (this method was often used to make crucibles). The item would then be left to dry gently. Features such as handles and spouts were usually added to the vessel when it had dried to a 'leather' hardness, or was firm enough not to distort when being handled. The simplest, and commonest, form of spout is the pinched spout made by pulling out the rim from inside with one finger whilst supporting the rim in position on the outside with two fingers. In this case this was done when the pot was first made. Tubular spouts were made either by throwing a small cylindrical shape, or by moulding clay around a forefinger, stick or bone. This was then smoothed onto the outside of the vessel once a hole had been made. Handles would be made by throwing, pulling or rolling out, and also applied by smoothing onto the outside of the pot. At this stage the bottom of the pot might be trimmed with a knife to give the familiar 'saggy bottom'. The 'saggy bottom' was we believe better for cooking with, as it helped to even out the differences of temperature in a cooking fire, which could easily crack a pot. Floors of the period weren't very flat themselves, so rounded bottom pots really didn't matter. The container could then be worked over with a damp cloth or wet hands, which brings the finest clay particles to the surface, giving a smooth finish. The inside of the pot could also be burnished with a smooth pebble or bone to smear the clay particles over each other producing a more water tight vessel. It could also be decorated by painting with a slip (a creamy mixture of fine clay and water) of a different colour to the body. Sometimes slip painting amounted simply to vertical stripes of slip, sometimes it took the form of scrolls and swirls. Glazes were almost universally lead based, giving a greeny yellow colour, although copper or iron could be added to change the colour or add speckles of a different colour. These were added to the pot after an initial firing. The glaze could have been applied as a dry powder, although most was applied as a water based paste. Liquid glazes could be applied to the leather hard pot with a brush or by hand smearing, which accounts for the uneven thickness of many of the glazes from this period. The pot could also be dipped in a bath of glaze. It was then left to finally dry before it was fired to make it hard. In the early period the pots were fired in a covered fire pit called a clamp. This did not always reach a very high temperature so the pots often did not fire very well. The fire that was built over the pots excluded most of the oxygen which fired the pottery black or charcoal-grey. By the later period firing was done in a simple kiln which was easier to control, guaranteeing a better and more even firing. The kiln was then sealed with wet clay leaving just the opening between the pits and a small flue opening. Some kilns had a raised central floor on which more pots were stacked, which allowed the hot air to circulate around the pots better. A hot fire was then built in the second pit in front of the opening. The potter would keep adding fuel slowly until the temperature was high enough to fire the pots, gauging its 'readiness' by the degree of luminosity of the items which glow whilst being fired. When this temperature had been reached the potter let the kiln cool down (sometimes for a whole day) until it was cool enough to remove the pots. Most would be hard and ready for use although some would have cracked if the clay and sand or shell had not been correctly mixed. With maintenance, a kiln of this type might last from five to ten years. By the tenth century there were several major pottery centres in England which exported their wares throughout the country. These included Thetford, Stamford, Lincoln, Torksey, Stafford, St. Neots, Winchester and Ipswich. Most of the pottery available in tenth and eleventh century Britain was of a buff, grey or pinky-orange colour. Red clay of the flowerpot terracotta type is almost completely unknown except for applied slip decoration. Glazes tended to be greeny-yellow, or rarely orangey-yellow and may have had speckles of dark brown, dark green or yellow. Some pots would have been almost black due to a process known as reduction. This happens when oxygen is excluded from the kiln by clamping off any airways, and leaving it for a period of time. It is interesting to note that although pottery was widely made in Denmark and southern Sweden, in Norway it was very rare, usually only being found as imported wares. Most cooking pots were made from soapstone - this is due to the fact that in Norway's rocky terrain, the easily carved soapstone is quite common, but clay deposits are quite rare. Chester-type pottery is a hard, sandy brown ware, wheel thrown and kiln fired. Dating to the tenth and eleventh centuries it is found from Chester to Hereford, covering most of Mercia. Chester ware pots have a distinctive flanged rim, rouletted shoulder and sagging base. Fine Whitby-type pottery is a grey or black sandy ware, thrown on a fast wheel and not very highly fired in a kiln. It has only been found at Northern monastic sites, and the only form known is a squat cooking pot with simple, squared, everted rim and a flat base. Leicester ware is a hard, sandy, grey ware with quartz inclusions, and is found only in Leicester. It is wheel thrown and fired in a kiln. It appears to date to the tenth and eleventh centuries. Forms include cooking pots and pitchers or storage vessels. Lincoln-type pottery has only been found in Lincoln. It is a hard, sandy ware, similar to Thetford-type ware but fired to a higher temperature giving a metallic finish, varying in colour from dark grey to orange. Forms known are globular cooking pots and straight sided bowls with coarse rouletting. Michelmersh ware is a smooth brown sandy ware, dating to the tenth or eleventh century. It was wheel thrown and fired in a single flue kiln. Forms include spouted pitchers with moulded rims; cooking pots with everted rims; upright and sloping dishes. Northampton ware is a hard, sandy ware varying in colour from grey to brown. Found only in Northampton, forms are mainly cooking pots. Porchester-type pottery is a hard sandy ware, tempered with finely crushed flint grit, wheel thrown and fired to a reddish or brown surface. It is found only in or near Porchester and dates to the tenth and eleventh centuries. Forms include wide, squat cooking pots, with sagging bases and decorated with horizontal lines and rouletting; bowls; and flat, shallow dishes. 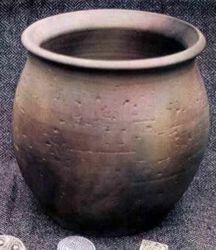 A Thetford ware storage jar. St. Neots-type is a soft ware tempered with crushed shells (probably in fossil form from the Oxford clay). The surfaces are usually black or red-brown. It was probably wheel thrown and clamp fired at low temperatures. It has been found over a large part of the country, including Cambridgeshire, Huntingdon-shire, Bedfordshire, Lincolnshire, Yorkshire and Durham. The usual forms of this type of pottery are tall cooking pots or jars, usually with sagging bases; bowls, usually with inturned or flanged rims and some with hollow 'spouts' for the insertion of wooden handles; dishes or plates; and lamps. These wares were too soft to make carriers for liquids such as costrels and spouted pitchers. Stamford-type pottery has a coarse and fine form. The fine form is an almost untempered off white ware used for glazed spouted pitches and bowls. The coarse form is a coarse, sandy off white or pinkish ware used mainly for cooking pots. Stamford ware was finely made on a fast wheel and fired in a developed single flue kiln. The glaze on Stamford ware appears pale green, pale yellow or orange, depending on the fabric. This was the most widely distributed pottery in the period, with Stamford-type glazed pitchers having been found in every county of England, and even as far as Montgomeryshire and Dublin. It appears to have been in production from the ninth to twelfth century. Forms included glazed spouted pitchers with one or three handles; jars; cooking pots; bowls with rims either rouletted or with applied thumbed strips; lamps, crucibles and lids. Thetford-type is a hard reduced grey ware tempered with sand, wheel thrown and kiln fired at fairly high temperatures. It was mainly produced in Ipswich, Norwich and Thetford. The usual forms of this type of pottery are tall cooking pots or jars, some with rouletted decoration; bowls; spouted pitchers with tubular and U-shaped spouts; storage jars, often massive hand built examples with multiple handles, decorated with applied bands and stamped designs; dishes; costrels; crucibles and lamps. The example to the right is large enough to hide a small child in. Torksey-type pottery is a sandy grey ware, rougher than Thetford ware because of the addition of quartz fragments, usually fired black. It was produced from the mid tenth to mid twelfth centuries. Forms include cooking pots; bowls with a down-turned outer-thumbed flange; lamps; ring vases; storage vessels; and a few spouted pitchers. Winchester-type is a high-quality, wheel thrown decorated pottery with a lead glaze, produced in Winchester itself from about 950-1100. It is a hard, well-fired sandy brown ware. The glaze colour varies from yellowish red to green or a dark olive green, mottled with orange. It is often highly decorated with applied notched strips, applied strips with circle and cross stamps, incised triangular zones, stamps and rouletting. It is found all across Southern England and shows a different, though parallel tradition to the contemporary Stamford-type wares. Forms are mainly spouted pitchers, although other forms are known such as cups; bowls; globular bottles imitating leather originals; small pots and sprinklers; lids; handled jars; tall narrow jugs and tripod pitchers. York-type pottery is a very hard ware with much grit added, giving a pimply appearance. It is well made on a fast wheel and fired to a high temperature in a developed kiln, although the wide range of colour variations suggest a failure to control the air intake. It appears to have been made from the tenth to mid twelfth centuries. Forms are similar to other types, although no storage vessels have yet been found. The types listed above are some of the main types of English pottery in our period. However, hand-made pottery was still being produced locally and good quality pottery was being imported from the continent. No doubt, foreign pottery was used to demonstrate an individuals cosmopolitan nature even then. Last updated 31 March, 2003. Article by Ben Levick 1993, Rolland Williamson 2002 Illustrations by Colin Levick.